TeamMaps.com provides tools to create advanced interactive maps for your website. This site is a further development upon mapping projects developed at Map Channels over the last 5 years. Team Maps is a full rewrite of the project also named Team Maps released at Map Channels in 2008. This new version of Team Maps includes features from Map Channels versions 3 and 4 such as the display of multiple feeds and clustering. We are looking for distributors and integrators to help with the marketing of Team Maps. Please contact us if you are interested. Register to create a new user account and team account. Once registered you can create new maps and feeds from the Dashboard. KML and KMZ feeds from the new Google My Maps can now be imported into Team Maps. Please note that custom marker images are no longer included in the KML exported by My Maps. It is recommended to assign a single category to your My Map markers and select an appropriate marker image for that category. There are 2 new options in the Edit Policy section. These options can enable or disable the adding of polygons and polylines to a Team Map. Apologies for the site being down for the last two days. A transfer of other sites to the server did not go as planned and the result was that the server had to be re-imaged and installed from scratch. The site should now be operational again. Please contact us if you encounter any problems. 2 updates have been made to Team Maps - KML Layers. These layers as displayed in the right-hand options bar and can set to be initially displayed or hidden. - Places Import. Use this function to import data from a tab seperated value (TSV) feed into a map's internal feed. A few updates have been made to Team Maps - substantial improvements to the update speed for clustering - changed default map settings - fixed the bug where feeds could not be deleted - edit policy can be limited add markers only (no polygons or lines) - name filter applies to all text displayed in the index sidebar. Four times the imagery. 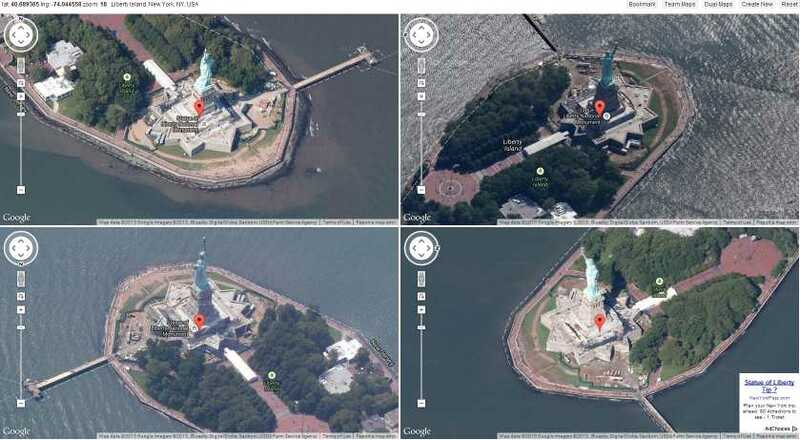 View locations using 45 degree imagery from four angles simultaneously. Three new tutorials have been added to help with: Creating Editable Maps, Combining Feeds and Templates. The Open Beta phase has started. Register now and create your Team Map. Closed beta testing has started. Participants can register for a free subscriber account. 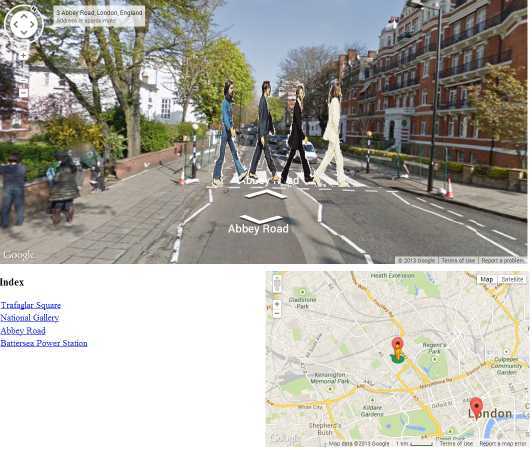 • The Street View Overlay displays an overlay image on top of street view imagery which moves in sync with the street view panorama . 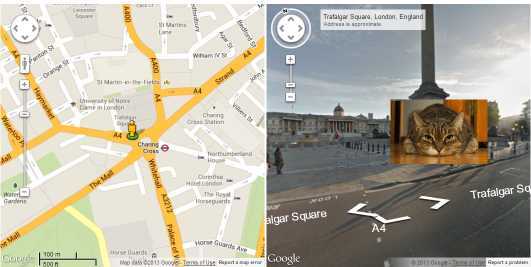 • The Street View Tour displays multiple street view locations with a different overlay for each location. Quad Angle Maps display four separate 45 degree imagery views of the same location. These views are linked so that as you pan one view the other views move accordingly. Create a Quad Angle Map now. View an example map of the Status of Liberty. Custom mapping solutions can be developed for your requirements.